This month EYLA Workshop focus will be on How Personality Type Affects the Mothering Style and objective of this session is to explore different types of personalities and their effect on parenting. Registration will start from Friday, May 2, 2014 at 8:30 a.m. Since seating at the workshop is limited, aspiring participants must confirm their participation at registration@ptan.org or phone # 36826991-4/36347611-4 Ext. 8554/8556. Available seating will be assigned on a first-come, first-served basis, and the registration will be closed once the workshop has been fully subscribed. (Please note that the request for confirmation, for attending the workshop, sent through e-mails or phone calls, received before Friday, May 2, 2014 will not be accepted. Members sending their confirmations through e-mails should send their e-mails from 8:30 a.m. (PST) on Friday, May 2, 2014. Any e-mail received on Friday, May 2, 2014 before 8:30 a.m. (PST) will not be accepted). This workshop aims to increase awareness about Autism spectrum disorder among practitioners, parents, special and mainstream teachers. The workshop further aims to share basic theories, principles, procedures and techniques for management of children with Autism spectrum disorder. Specific focus among various procedure and techniques will be on behavior therapies. Mrs. Maria Aamir has more than 15 years of multi-disciplinary experience as a senior therapist in the field of Autism on national and international level. She is also a corporate trainer and has been conducting training workshops on Autism for various forums including national and international. She did bachelor in Occupational therapy from JPMC, Karachi, and Masters in Audiology (speech pathology) from University of Karachi. In addition she has done different professional courses in ABA from Dubai. She is member of difference Autism associations like Genesis International Ventures Ltd., ASHA, PPA, Madadgar, supportive member of Dar-ul-Sakon. She is Director of Autism Care Foundation and Rehabilitation Karachi, and also running private clinic in DHA Phase II as Autism Consultant. In view of limited seats available, prior registration for this workshop is mandatory. Kindly confirm your participation latest by Thursday, April 24, 2014 at registration@ptan.org or (36826991-94/36347611-14 Ext. 8554/8556), as this will facilitate us in organising the workshop effectively. It is a pleasure to inform you that ASSET is organizing the Eight ASSET Olympiad on Saturday, May 24, 2014 at AKU-IED. The theme of the Olympiad is “What is & What should be”. This year’s Olympiad has been designed with the aim to explore the perception of children about various issues that Pakistan is currently facing. It will also give platform to children to share how they would like to change the situation. The main objective behind this activity is to develop a positive, healthy and realistic attitude towards betterment of Pakistan as a nation. The students will work in groups and they will either prepare Skits or Posters on the given issue. Winning team members will get shields and certificates. All the participating students and teachers will also get certificates. The event has been designed to ensure a stimulating experience for all the participants. · The contest is open to all schools of Pakistan. · Each school will be required to send one teacher and four students from Classes VII to X. · Two (2) students for preparing and performing in skits. · Posters and Skits will be evaluated by panel of judges. · The decision of the panel will be final and undisputed. · Participants will be required to arrive latest by 8:30 a.m.
· Event will start at 9:00 a.m. sharp. · The event will be concluded at about 1:30 p.m. The Eight ASSET Olympiad will be held at Aga Khan University, Institute for Educational Development (AKU-IED) on Saturday, May 24, 2014. · Schools are requested to send in the duly completed registration form (attached) latest by Thursday, May 15, 2014. · The registration form must be completed in all respects and the names of the students nominated by the schools must be clearly spelled and must be written in CAPITAL letters. · The forms must be submitted along with the Registration Fee at PTAN Office, IED. A token of Rs. 1,600/- (One thousand six hundred only) is payable as registration fee along with the registration form, either in cash or in the form of pay order to be made in the name of The Aga Khan University. We urge you to take part in this novel event and contribute in its success. Please feel free to contact PTAN Office if you have any query or require clarifications. Looking forward to your continued support and cooperation. Ø Participating teachers will be able to inform students about the basic steps one should follow before making career choice; identifying ones interest, skills, ability and values. Ø To help participants understand difference between guidance and counseling. Ø To help participants to understand career options and for O’ levels teachers importance on subject choice while selecting groups. 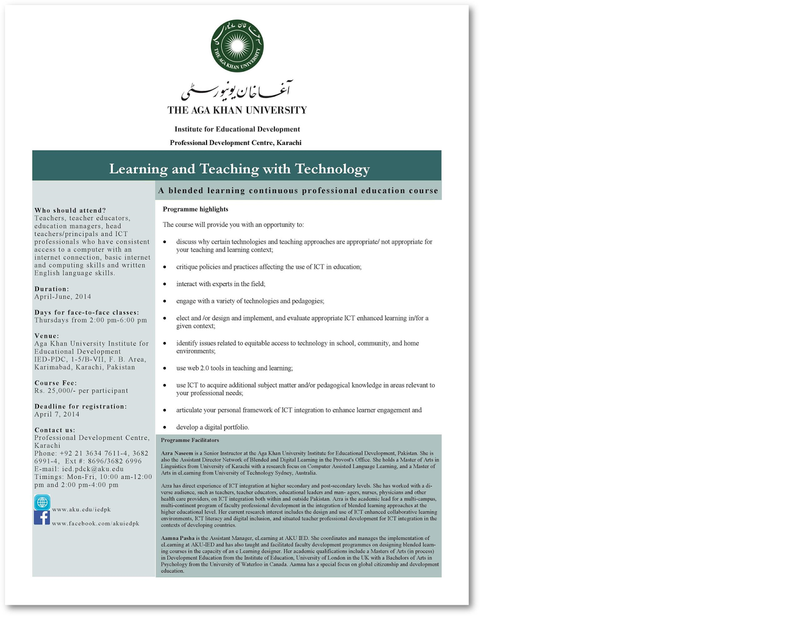 Ms. Azmina Afzal is a Teacher Trainer and Career Advisor. She has done her Advanced Diploma in Teaching English as a Foreign Language, Master in Education and Master in International Relations. She is also an MBA in Educational Management and currently working on her MPhil Thesis. She works at Foundation Public School as an Academic Head and also a visiting faculty at Institute of Business Management. In view of limited seats available, prior registration for this workshop is mandatory. Kindly confirm your participation latest by Thursday, April 24, 2014 by 4:00 p.m. at registration@ptan.org or call 36347611-14 /36826991-4, Ext. 8554 /8556, as this will facilitate us in organizing the workshop effectively. Ms. Shairose Irfan Jessani, currently working as a Vice Principal-Academics at Aga Khan Higher Secondary School, Karachi. 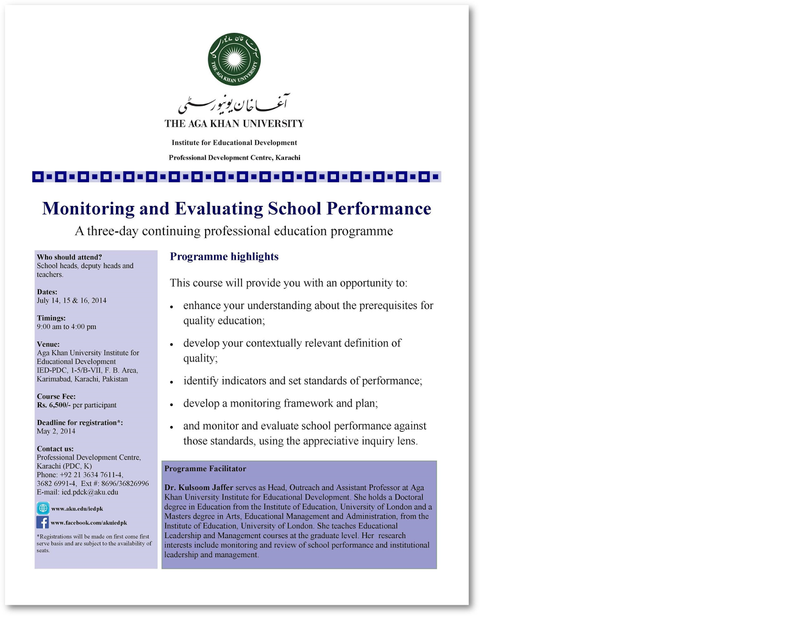 She has done Masters in Science (Chemistry) from Karachi University and Masters in Education (Teacher Education) from AKU-IED with distinction in course work. She has contributed both at school and community level as well as worked with organizations like PTAN, Edlinks, Ministry of Education and AKU-IED as a resource person. Her major interest areas are assessment, educational management, teacher leadership, environment, Science education and ICT integration. In view of limited seats available, prior registration for this workshop is mandatory. Kindly confirm your participation latest by Thursday, April 24, 2014 by 4:00 p.m. at registration@ptan.org or call 36826991-94/36347611-14 Ext. 8554/8556, as this will facilitate us in organising the workshop effectively. On behalf of SAP Executive Committee, we would like to invite school teachers for the academic session to be held on Saturday, April 12, 2014. Kindly confirm your participation latest by Thursday, April 10, 2014 by 4:00 p.m. at registration@ptan.org or call 36826991-4 / 36347611-4 Ext. 8554 / 8556, as this will facilitate us in organizing the workshop effectively.